Tuesday July 1st 1884 Mother and I worked very hard cleaning the kitchen and pantry this forenoon. Mr. Burton came back and brought another gentleman with him for a boarder. I did some work up stairs in the afternoon putting on clean net on the window screens and putting up the curtains. Wednesday July 2nd 1884. We had the washing done this morning. It rained so I put some in the garret. I sewed one breadth of the dining room carpet before noon. It cleared of soon after dinner and I put out the rest of the clothes and washed some calicoes. Mother and I finished sewing the carpet and she rode over town just before supper and I just after with Rob, pleasant evening. 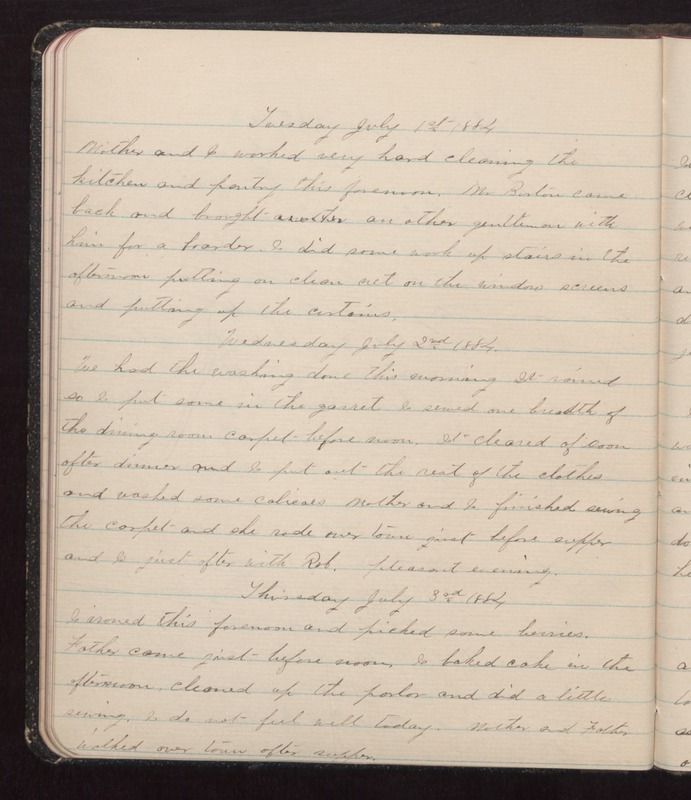 Thursday July 3rd 1884 I ironed this forenoon and picked some berries. Father came just before noon. I baked cake in the afternoon, cleaned up the parlor and did a little sewing. I do not feel well today. Mother and Father walked over town after supper.